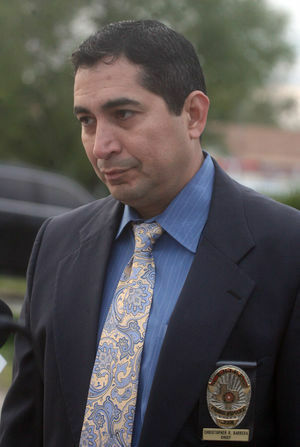 Among the factors that contributed to the termination of Palmview Police Chief Christopher Barrera last week was a slew of text messages in which he appears to make lewd and homophobic remarks. The messages from Barrera were about, or directed to, Palmview Fire Chief Jerry Alaniz, who could not be reached for comment. Barrera declined to explain what led to his remarks — which The Monitor received from the city through an open records request — because he said the reason was personal in nature. “I was upset at him, and I was going off on his personal stuff,” Barrera said. “It had nothing to do with work,” he added, noting that he sent the messages after work hours. Barrera’s remarks were made within a group text message thread that included the two men in addition to other unnamed individuals Barrera referred to as friends. The texts, which were sent on Friday, April 20, were brought to the city council’s attention during a Monday, April 23 meeting. After council members were shown the messages during executive session, they voted to terminate Barrera, citing disciplinary and performance issues. Interim City Manager Leo Olivares said the messages contributed to his recommendation to the council to terminate Barrera, who Olivares had placed on administrative leave April 16 while the city reviewed personnel issues in the police department. Ramirez said he didn’t believe the messages being sent after work hours was a relevant factor. “When you’re in a position of the chief, on and off the job you must present a certain image, and that is not an image that Palmview wants to present,” he said, adding that he believed the messages would create a hostile work environment for Alaniz and possibly others. “(The messages) had a heavy weight on my decision to terminate the chief, as well as some of the other things that (Olivares) brought forth weeks earlier,” Ramirez said, referring to issues within the police department. Those issues were the topic of discussion in a March 16 meeting between Olivares and Barrera during which Olivares reportedly said he had lost faith in the chief’s ability to effectively lead the police department and advised Barrera to consider his options. Three days later, the chief filed a sexual harassment complaint against Olivares. Olivares denied Barrera’s allegations, and City Attorney Gus Acevedo concluded that the allegations did not amount to sexual harassment, according to a report dated April 5. After he filed the harassment complaint on March 19, Barrera was absent from the department for nearly two weeks before returning to work on April 9. He was placed on the aforementioned administrative leave a week later. Following his termination, Barrera said he is considering taking legal action against the city, believing his sexual harassment complaint was not properly investigated. His decision on that, he said Monday, was still pending.